Around 28 years ago, I decided to make my daughter and my nieces their very own cuddly, toy, stuffed bunnies. 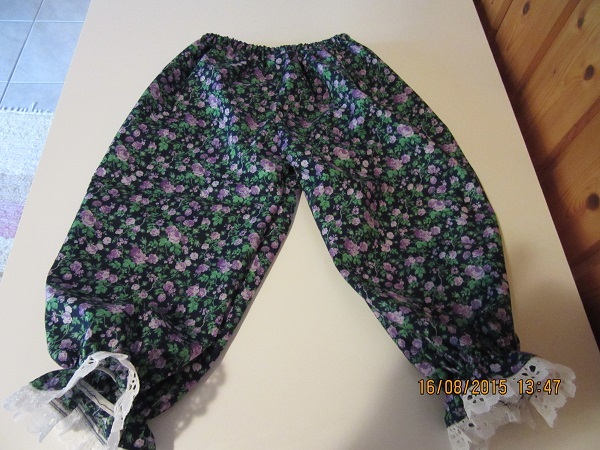 Now anyone who sews can relate when I say that project was a labor of love! But, the girls loved them and I loved the girls, so it was all worthwhile. 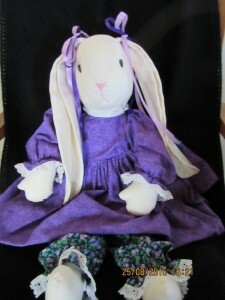 Each bunny had a sweet little calico print dress, contrasting bloomers and coordinating hair ribbons. One of the original bunnies is pictured above sitting in my Grandpa’s rocking chair. Not quite an antique but treasured all the same. The bunny…I mean. Not the rocker. That’s already more than an antique! Sometimes my thoughts get confused then the words are a mess or something to that effect. 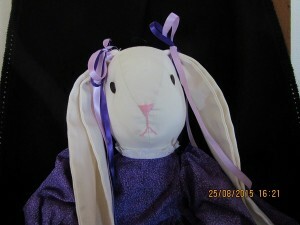 Now, there are 3 little Granddaughters and I decided they all needed a bunny of their very own. Now mind you, I have not sewn anything in years, but I told myself, “peshawhhhh, piece of cake!” Wow. Just wow, was I ever wrong! I had to teach myself how to read a pattern again. How to mark patterns. What the symbols mean. I have a new sewing machine too, so I had to learn how to use it. I don’t think I am as quick a learner as I used to be. There were many “huh” and “uh oh” moments. And I know for certain the eyes of those sewing needles used to be a whole heck of a lot bigger than they are today. Took me 10 minutes just to thread the darn thing! And….the needle threads from front to back so I couldn’t even use a needle threader! But….I digress…again…..sigh. Anyway,the first order of business is determining what color Granddaughter #1 wants for her bunnies clothes. Ah hah…I am told the color purple is Little Misses favorite. Material or “Yard Goods” as they were called back in the day, is purchased. 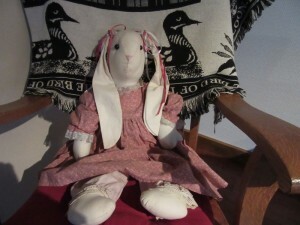 Got the matching threads, pre-gathered lace, and hair or rather “ear” ribbons and elastic. Now let the games begin! First we need to construct a bunny. Unbleached Muslin or in this case, cotton twill….I am not in Kansas, Toto, and must do with what’s available here. All cut out and ready to sew the legs on backwards. Then the arms on backwards. Then the head…..no, wait….I caught that one! Goodness! Grab that bag of polyester fiberfill…. (question: Was Polly Ester a real person?) and stuff the bejeebers into Ms. BunBun. I found that both a wooden BBQ Skewer and large wooden knitting needles help poking the stuffing in the right places. Actually a very good use of knitting needles that will never be used to knit, but that’s another story. So now, we have your basic bunny. Kind of sad and lonely looking, isn’t it? 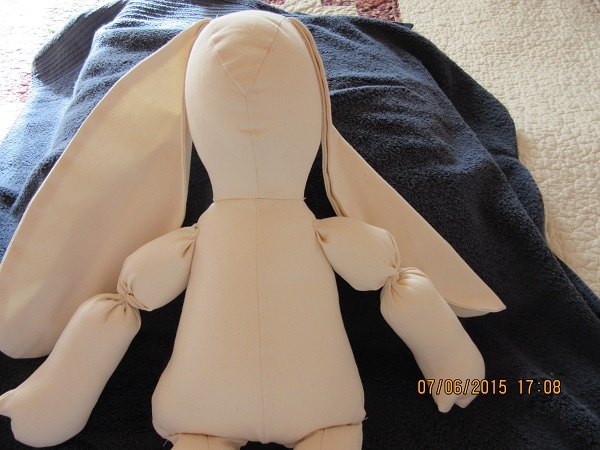 What’s a poor bunny to do without a face and clothes? Time for her to get some pants on. I don’t think it’s proper for her to be running around without her bloomers! I think it’s time for her personality to come out. How about a face? A belly button for fun and a heart because this bunny needs little girl loving. don’t work like they did 28 years ago. Or, maybe the elastic is made just so much tighter and harder to pull. Yep…that must be it! Ready to be loved for many years to come! Love this! Thank you for sharing. 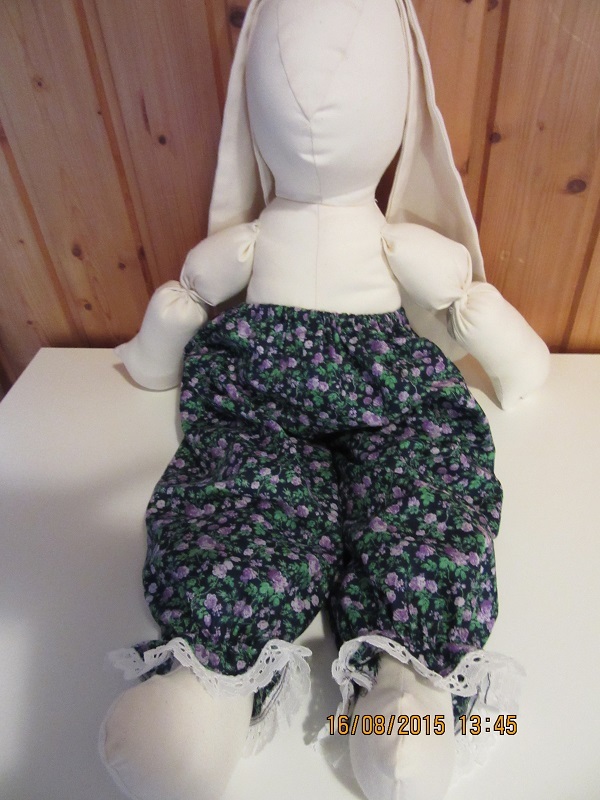 I’d love to make one for each of my three grand-daughters! So sweet.